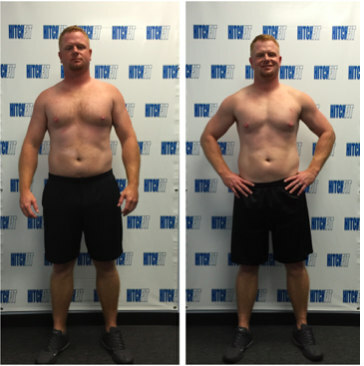 Diet is the Key to this client’s Hitch Fit weight loss success! Overland Park Personal Training – Diet is the key to weight loss success. My entire life, I have always felt like I was in “Good” Shape, but not “GREAT” Playing football for 13 years, from Middle school , High School, College and a short stint in Arena Football, I believed I knew “how to work out”. Through most of my teens and college, routine exercise was a way of life. Wake up, eat, workout, eat, workout, eat, run, sleep- Rinse and Repeat. During this time, I was lifting for Mass and increasing body weight was a good thing. Carb loading, Low Reps at Heavy weight were a way of life. No one had time for “Curls for the Girls” and Core Strength was more important than 6 pack abs. Since College, I did what most people do; Land a great job, Buy a house, meet the girl of my dreams, wedding, honeymoon, buy a second house, start a family- My life had Definition! As life got busy, exercise was the 1st and easiest to eliminate from the routine. When we found out we were expecting our 2nd child, My life had Definition, but my body and self-image were lacking Definition. 9 years of cheap beer, ½ price burger nights, lavish date nights with dessert had caught up with me. I kept lying to myself because the weight on the scale never really changed. 235lbs of Meat Head in College had become 235 lbs of flab sitting behind a desk all day. I knew I had to do something. I want to be a great role model for my children, and If they were witness to bad eating habits and poor exercise routine, how was that possible? I needed someone to kick me into gear. 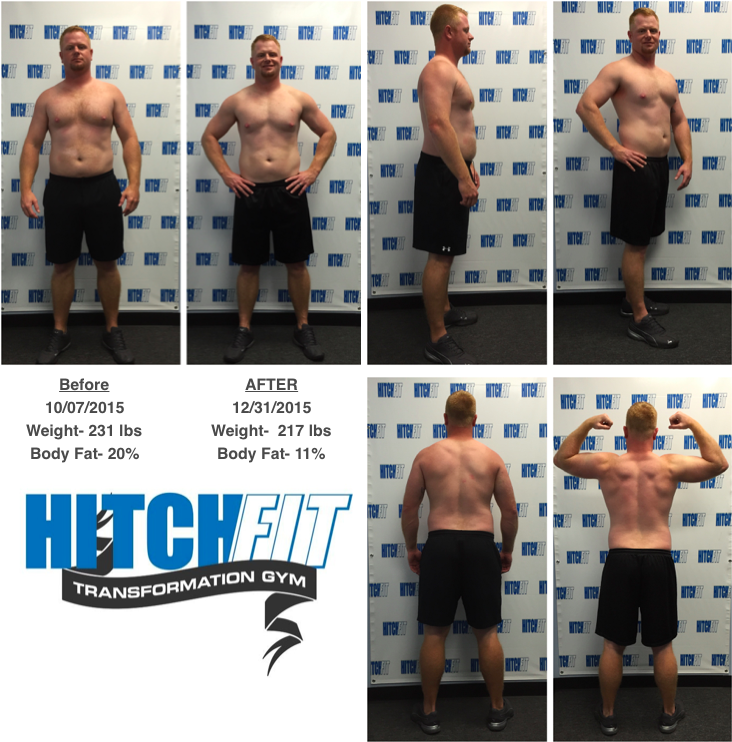 I met up with Kurtis at Hitch Fit in Overland Park for a consultation- we went over what the program was about, and then got to price…. After a few weeks of trying a few other things, I realized I lacked commitment and went back to talk with Kurtis. Like any other trainer will tell you, Kurtis let me know Diet is the Key. I had been a “Convenient Eater” and meal prep was not in my vocabulary. Eating on the run, quick lunch between meetings, or not eating at all during the day and then bingeing for dinner was typical. October 2015, My last Dr. Pepper for the year. Game 1 of the World Series at Kauffman Stadium would mark my last beer for the year. And quick lunches at whichever Fast Food joint close to the office were over. I started grilling 5-6 chicken breasts on Sundays, loaded up on Veggies during grocery shopping. Lunches during the week became even more convenient than I thought. Started Drinking Protein, not just any Whey Protein, but Hard Magnum’s Quattro. Kurtis explained the difference between good Protein drinks and Bad. It was an educational experience on healthy eating, something I could have read online somewhere, but I made a commitment to seek out great advise, and was sticking to it. Kurtis quickly showed me the difference between lifting for mass and brute strength, and lifting for definition and toning. We isolated each our lifts, and the days of Power Cleans, Deadlift, Benching 300+ lbs once or twice were over. It was a humbling experience for me to see that 100 pushups were a lot more difficult than a 3-4 rep set at higher weight. My muscular strength was there, my muscular endurance was non-existent. Over the 12 weeks, I started a spreadsheet with graphs that showed my results and gains I was making. Looking in the mirror, I couldn’t see it at first, but I could feel it. My abs were getting tighter, my chest was taking shape, my back and arms felt jacked all day long! While still early in his career, Kurtis’ education, experience and the pride he took in my Transformation showed me he wasn’t in it for himself- He was in it for my results. It defiantly helped having someone hold me accountable, yet encouraging me along the way. I don’t think I could have achieved the results I did without his coaching. The weight on the scale has never been important to me, but the % of BF drops I have seen are starting to expose the definition of those hard to find muscles. Less than 10% BF is still a goal of mine. What was hard to understand before, but is clear now, eating healthy along with a workout that keeps your HR up is key in toning. I still plan on utilizing Kurtis and his knowledge now that the 12 weeks are up. Is there anything you would like to share with others that may be in the same place you were to help them? Like anything worthwhile in life, It has to start with YOU. Don’t anticipate paying someone X amount of dollars, and them handing you results. Fad workouts and diets don’t work. To truly achieve the results you are looking for takes Time, Effort, Sacrifice and a Positive Attitude.